Alert! Due to Hurricane Michael our Panama City offices remain closed until power is restored. A driving force in the real estate industry is communication. For a REALTOR®, communication is key, frequently being a liaison between the buyers and sellers, the other agent, the title company, etc. 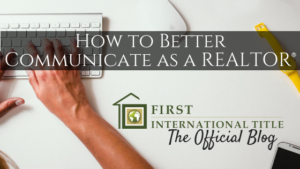 Communication is really the backbone of the Real Estate business and a real estate agent who can communicate clearly and effectively will find success in the industry. Andrew Siefers is a Licensed Professional Counselor with My Rooted Soul Counseling. He received his Master’s Degree in Counseling from Dallas Baptist University and has a decade of counseling experience in the DFW area. We sat down with Siefers to get some expertise about basic communication skills and how this applies to real estate. One of the first things Siefers mentioned was watch your I’s and You’s. For example if you say, ‘Do you think this is a good idea?’ This can be seen as passive. Instead say, ‘Hey, I think this is a good idea,” which can be seen as more direct, action oriented, and less attacking. For example, have you ever known yourself to indicate you are feeling “like”? Individuals express emotions by saying they ‘feel,’ and then it is followed by a feeling word immediately after. If the real estate agent is paying attention to a potential clients feelings at an open house or listing appointment, it gives her the ability to have a deeper connection to that potential future sale represented in the individual they are conversing with. Paying attention to the clients feeling words will help the REALTOR® to interpret the client’s feelings in the right way. Siefers indicates he sends out a free guide explaining emotion words and definitions on his website for those who request the info. Siefers suggested a practical application for fixing this for yourself. Experiment with how many times one might hear oneself say, “I feel like…” throughout the day. The phrase “I feel like… “ when not followed by a feeling word means “I think…”. Correcting your feel and thinking words will increase your emotional maturity and acuity zeroing in closer to the truth. One can videotape or record herself in a normal conversation and then go back, listen to it, and critique herself on the way she speaks. Or simply try to make a mental note every time she says “feel like” rather than “I think” and make an effort to express the correction out loud. Before long you will be doing great at this. A REALTOR® may walk into a potential deal desiring success, but the client still has a lot of questions. If the REALTOR® does not pause, stop or understand the clients questions, he or she is facing a potential communication disaster if the REALTOR® interprets the situation on his own desire to move forward, rather than listening to what the client is saying. If the agent is not listening well, there won’t be as much opportunity to close the deal. The stone wall analogy partly is illustrated from the Four Horsemen of the Apocalypse by Gottman’s research on marital relationships. The Four Horsemen are the following: Criticism, Defensiveness, Contempt and Stonewalling. Stonewalling means building a wall in between the real estate agent and the client, not attending to a customer needs because you don’t like the client, aren’t making a profit, don’t connect or don’t want to give them your time, etc. are all causes of stonewalling. The picket fence analogy has a gate and this gives the REALTOR® the optimal ability to open and close the communication gate as she wishes. This means laying out times when she can focus on her clients, and then saving other times when she can be with her family. The no wall at all analogy means that anyone can come and go on my property, time, and feelings as they please. This may mean clients think they are allowed to call the REALTOR® late at night or early in the morning, potentially ruining sleep or complicating the morning routine of the agent to provide balanced service. “You want to value yourself, and take care of yourself, promote healthy living and model these behaviors for your client,” Siefers said. When asked about tips for dealing with high-emotion or high-stress transactions such as death or divorce, Siefers chuckled and suggested seeing a counselor. Also, be sure to get adequate sleep, rest, relaxation and exercise. Physical health and nutrition are very important in this situations. Siefers also advised the agent to know limits. Don’t advise clients with expertise he can’t back up, and don’t get into the intimacies with your clients who are hurting and vulnerable. The last bit of advice that Siefers gave for the REALTOR® is to simply say what she means. Also, knowing the definitions of words that the agent uses will help her be more confident in her day-to-day conversations and decisions. The REALTOR® should not be afraid to do research or ask questions and stay within the boundaries of integrity and excellence that she strive to exude. You can contact My Rooted Soul Counseling by going to https://myrootedsoul.com/home/. As a title company, we partner with the real estate agents to ensure s/he and the buyers or sellers feel comfortable going into closing. Do not hesitate to call your local First International Title office with any questions or concerns you may have!